Combine Chiang Mai Paste and coconut cream in a bowl then add prawns and marinate for half an hour. Lift prawns out of marinade allowing excess to drop off before wrapping one prawn at a time with wonton wrappers. Lay the prawn lengthways along the wrapper, leaving only the end of the tail overhanging the edge of the wrapper. Fold the top edge over the head-end of the prawn to create a sealed end once the wonton is rolled. Wrap wonton around prawn so that only the small tail end with shell attached is sticking out for aesthetic value and a handle to grasp while eating. TIP: Use water to wet edges of wonton wrapper before rolling to help it stick. If prawns are particularly large you may require two wonton wrappers side by side. Once all prawns are encased in wrappers, heat oil for deep frying and cook until wantons turn golden brown (approx. 4 - 6 minutes). Be careful not to have oil too hot. 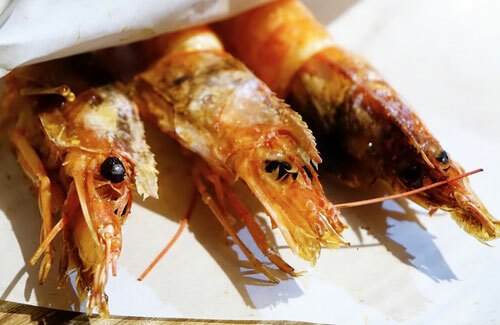 Larger prawns may require a little longer to cook. TIP! This recipe is perfect served as a canapé or on a bed of Asian herb salad greens as an entree.